Traveling in Malaysia is easy, affordable, and exciting! Malaysia's generous visa policy gives travelers from the U.S., Canada, and European Union up to 90 days to explore Kuala Lumpur, the rainforests (including a side trip to Borneo), and the many beautiful islands on both sides of the country. Thailand — Malaysia's big neighbor to the north — gets more attention from tourists. A lot of travelers skip Malaysia altogether during their trips to Southeast Asia. Sadly, they're missing out: Malaysia welcomes everyone with a diverse mix of culture that is different from anyplace else. Traveling in Malaysia provides opportunities to sample culture from a mix of Malay, Chinese, Indian, and indigenous people all in one place. 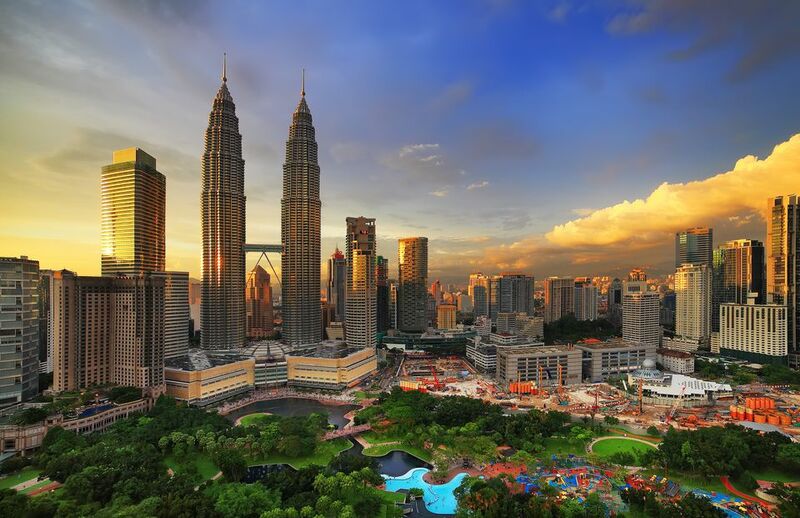 Kuala Lumpur is a melting pot of Middle Eastern, South Asian, and many other cultures. You'll get to experience food, festivals, music, and traditions from many different ethnic groups — all in one place! Malaysia is very easy to travel. English is widely spoken; communicating rarely poses a problem in the top destinations around Malaysia. Roads and travel infrastructure are generally in good condition. Malaysia can be traveled on a budget, although accommodation costs are slightly more expensive than those found in Thailand and Indonesia. Guesthouses are often a little more "grungy" than those seen in Thailand at the same price points. Decent accommodation in Kuala Lumpur can be pricey; budget places come at a lower standard of cleanliness. Bed bugs have even made a resurgence in some guesthouses. Kuala Lumpur may be a good place to try out Couchsurfing or AirBnB for the first time. Eating is inexpensive at street carts and in food courts, however, consuming alcohol is significantly more expensive than in Thailand. Malaysia as a nation is split between two places. "Peninsular Malaysia" is also referred to as "West Malaysia" and includes Kuala Lumpur, other places on the mainland, and the islands in the area. "East Malaysia" refers to the Malaysian states of Sarawak and Sabah along with the federal territory of Labuan located on Borneo, the third largest island in the world. This part of Malaysia is commonly referred to as "Malaysian Borneo." While traveling in Malaysia, travelers get to interact with people from a diverse mix of different ethnic backgrounds. In any given situation, you'll often find Malay, Indian, and Chinese doing business and speaking English together. The indigenous groups in Malaysian Borneo, collectively referred to as the Dayak people, are made up of over 200 tribes and subgroups. Many have their own languages and customs. Abbreviation: The local abbreviation of "RM" is often placed before the amount. Division: Each Malaysian ringgit is divided into 100 sen.
ATMs on all the major networks are reliable and can be found throughout Malaysia. All primary currencies can be exchanged in cities and tourist destinations. Credit cards are accepted only in large hotels and shopping malls, although a fee may be added; Visa and Mastercard are the two most accepted types of credit cards. The use of traveler's checks is becoming more and more obsolete. Malaysian ringgit is available in denominations of RM1, RM5, RM10, RM20, RM50, and RM100 notes. ATMs usually only dispense denominations of RM50 and RM100. Breaking large denominations can sometimes be a hassle; when possible, opt for machines that give smaller banknotes. Tipping is not customary in Malaysia, however, a small tip may be expected by staff in hotels who have grown accustomed to tipping Westerners. A service charge of 10 percent is added to the bill in some hotels and restaurants. When compared to some tonal Asian languages such as Thai, Vietnamese, and Mandarin, the Malaysian language is relatively easy for travelers to speak and learn. Bahasa Melayu doesn't use tones, and the rules of pronunciation are very straightforward and predictable. Even more convenient, the English alphabet is used — travelers can read signs and menus a lot easier than when trying to decipher an unfamiliar script. Although the official language is Bahasa Melayu, a majority of the population also speaks English due to the large mix of ethnic backgrounds. Business is often conducted in English with heavy doses of regional slang thrown in. English often serves as the working language at universities and in government offices. Greetings in Malaysia are based on the time of day. Learn the basics while you are there — attempting the local language is a sure way to get a smile or two. Unless you have special requirements (e.g., work), no need to apply for a travel visa before visiting Malaysia. U.S. citizens are granted free entry for up to 90 days upon arrival. After those 90 days, if you wish to stay longer, you can simply exit the country for a while and then return to receive 90 more days. Sarawak, one of the two Malaysian states in Borneo, maintains its own immigration controls. Although a visa is free, travelers receive a separate stamp for Sarawak that may be of a shorter duration. Kuala Lumpur: Malaysia's capital city can be a little hectic and appear grungy to the uninitiated, but it has a unique character that will definitely win you over! Hidden delights abound in the big city. Penang: A UNESCO World Heritage Site because of the colonial history, the large island off the west coast of Malaysia and settlement of Georgetown are famous for a thriving food scene and multicultural heritage. Borneo: Malaysia shares the world's third largest island with Indonesia and Brunei. On Borneo, you'll find a nature-lover's dream with wild orangutans and plenty of national parks teeming with rainforest. Flights from Kuala Lumpur to Borneo are tantalizingly cheap. The Islands: Langkawi and Tioman Island are very popular islands to visit, as are the two Perhentian Islands; each has their own distinct personality and plenty of perfect beaches. The diving in the Perhentian Islands is inexpensive and excellent. Cameron Highlands: If you're getting burned out from sweating through urban sprawl, the much cooler Cameron Highlands are a green, peaceful escape with trekking through tea plantations. Malacca: Colonial history and a pleasant charm draw visitors to this small and clean UNESCO World Heritage Site. With the mix of ethnic groups and religions comes plenty of holidays. There's often something going on somewhere! Ramadan — the Muslim holy month of fasting — is observed throughout Malaysia, as is Chinese New Year and Hari Merdeka, Malaysian independence day on August 31. The Rainforest World Music Festival held each summer in Sarawak, Borneo, is one of the largest music festivals in Asia. The three-day event is a celebration of indigenous culture and daily workshops followed by bands from around the world. Because of the sizable Indian population, some big Indian festivals such as Holi are observed in parts of Malaysia. A majority of international flights come through Kuala Lumpur International Airport (airport code: KUL) into either KLIA or the KLIA2 terminal, hub to Air Asia and other low-cost airlines. A shuttle service and train connect the two terminals, however, you should verify from which terminal you'll be departing before you arrive for a flight. Comfortable five-hour buses (some even have Wi-Fi on board) run daily between Kuala Lumpur and Singapore, allowing you to visit both cities without the need to fly! The best time to visit Malaysia depends upon where you are going. Weather often differs between the islands on either side of the peninsula. Kuala Lumpur is pretty much hot and wet throughout the year. Afternoon thunderstorms are common, but July is the driest month. The best time to visit Langkawi is during the dry months of December, January, and February. On the other hand, the Perhentian Islands are best during the summer months of June, July, and August. June and July may be the best months to visit Sarawak, however, February and March are drier for Sabah.